It’s that time of year again, folks: The annual rise of Mariah Carey’s yuletide dominion, as “All I Want For Christmas Is You” begins its inevitable death march onto the year-end musical charts. This year, Carey had an extra-special victim falling prey to her jingly, jangly sonic steamroller, though: Mariah Carey. Specifically, Carey just managed to replace her own album—the LP Caution, which came out a couple of weeks ago—on Billboard’s R&B charts with her 1994 mega-smash Christmas, the vector through which the ubiquitious earworm of holiday longing was first unleashed upon the planet. Given that Carey reportedly still makes some pretty hefty bank on the album, every single year, we have to assume that she isn’t too upset about it. Every now and then, some pretender—The Shins, say—tries to unseat Carey from her dark throne at the very heart of winter, but it never lasts for long. 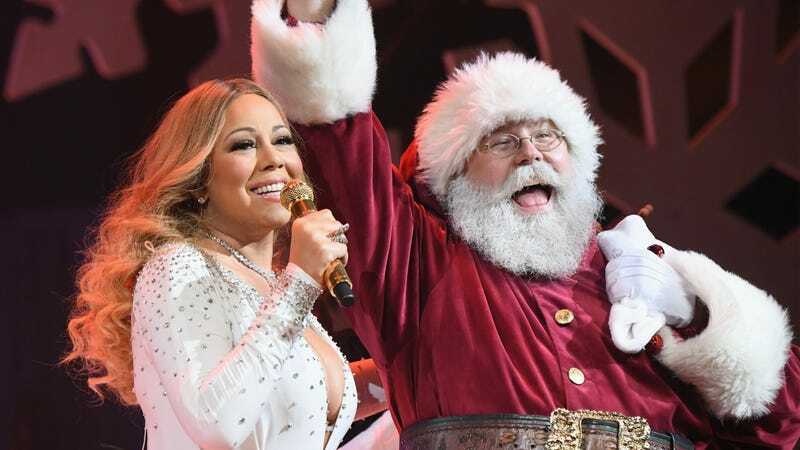 Now, apparently not even Mariah Carey can defeat “All I Want For Christmas Is You”; it’ll presumably be around long after the human race dies off, driving robots and evolved cockroaches alike nuts while they’re just trying to get their Christmas shopping done.